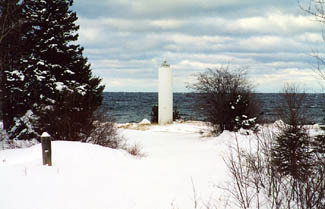 There is, at present, a light on the northern extremity of Grand island, which is simply a coast light, and suited to serve the general purpose of navigating the southern shore of the lake. The question before us now is, whether lights shall be established for local purposes, and especially for the purpose of bringing the harbor of refuge at the bottom of the bay into convenient use. It will be very easy to satisfy the board that not only one but three lights should be erected in this vicinity. There are two harbors at the bottom of the bay, well sheltered and affording good anchorage for vessels of all size. One of them is on the south side of Grand island, and the other is opposite, on the main land. There are fine entrances both on the east and west side [of the island], but both of these entrances must be lighted to make them secure. The committee recommended that range lights be placed on Williams Island, located a mile-and-a-half off the west shore of Grand Island, to mark the west entrance to Grand Island Harbor and to help mariners avoid shoal ground near the southwest end of Grand Island. Congress provided another $10,000 for the lights on July 28, 1866, and after consulting with shipmasters acquainted with the harbor, the Lighthouse Board decided to place the range lights on the mainland, just west of Grand Island, rather than on Williams Island. Construction of Grand Island Harbor Range Lights was to be performed in 1867 by a work party engaged at Gull Rock Lighthouse, but the drowning of William Tunbridge, the foreman in charge of the men, forced the work on the range lights to be postponed until 1868. During the summer of 1868, a seven-room, one-and-a-half-story dwelling, with a rectangular tower set atop one of its gabled ends, was built for the rear light, and a wooden tower was built for the front light. The base of the front tower was eight-foot-square, but its four corners were beveled to create an octagonal shape for the upper half of the structure. The range displayed its fixed white lights for the first time on August 15, 1868. 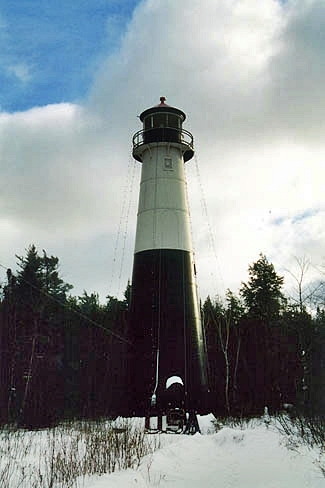 Similar range lights were also built at Copper Harbor in 1868, and the same design was later used at Baileys Harbor in 1869, at Presque Isle in 1870, and at Eagle Harbor in 1877. The rear range light at Grand Island Harbor was different than all the others in that its tower atop the dwelling was significantly taller. The range lights, separated by 375 feet, were situated on a swampy, 115.5-acre parcel purchased by the government in 1866. 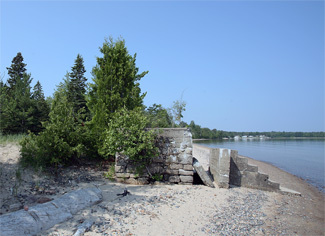 A plank walk connected the front and rear lights, and in 1890 a ten-by-twenty-foot boathouse was built near the front light. In 1905, a brick cellar was built under the combined tower and dwelling forming the rear light, and a 500-gallon oil house was built of concrete blocks. In 1876, Napoleon Beedon and Casper Kuhn swapped station assignments, with Beedon going to Au Sable Lighthouse and Kuhn coming to Grand Island Harbor Range Lights. 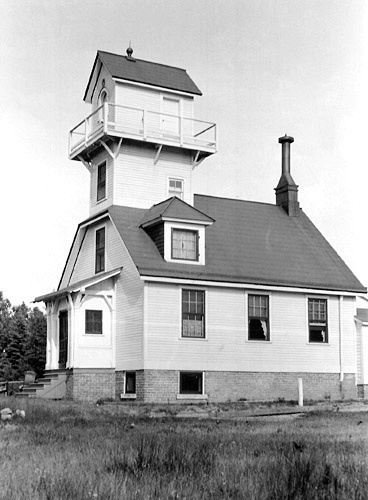 Keeper Kuhn, who had been the head keeper at Au Sable Lighthouse since it was established in 1874, served nineteen years at the range lights, longer than any other keeper, before passing away in 1895. 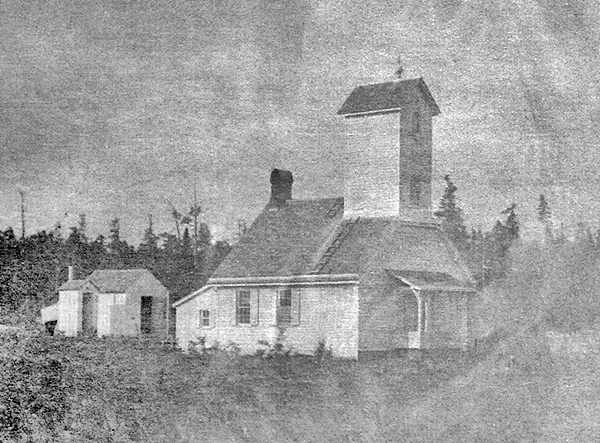 As part of a plan to de-staff the range lights, a conical steel tower was erected 125 yards behind the keeper’s dwelling in 1913 to house the rear range light. This tower was originally painted black except for the front half of the upper twenty feet of the tower, which was painted white. On August 15, 1913, the illuminant used in the range lights was changed to acetylene, and the characteristic of the lights was altered. 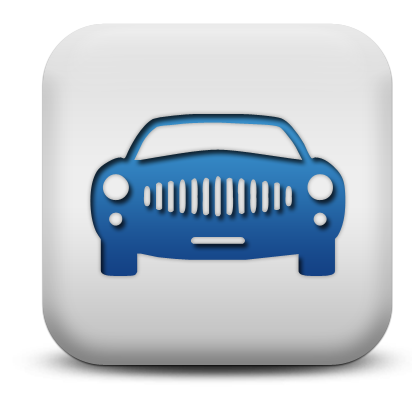 Instead of being fixed white, the characteristic of the front light was now a white flash every second, and the rear light was alternately on for a second and off for a second. 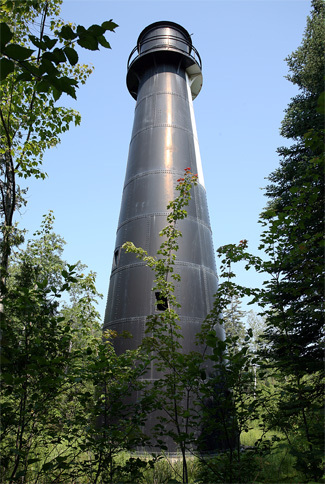 Though no longer needed, the keeper’s dwelling, minus its tower, was retained for some time before finally being sold and moved to Munising, where it is used as a residence. 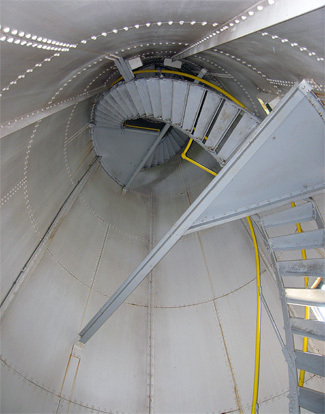 In 1920, a white mast, fitted with a slatted daymark and tank house, replaced the wooden tower as the front light. Grand Harbor Range Lights were electrified in 1941 and equipped with 25-watt, 110-volt lamps. In 1969, the rear range light was discontinued, and the front light was modified and renamed Bay Furnace Directional Light. Instead of showing a fixed white light, Bay Furnace Direction Light showed red from 163° to 166°, white from 166° to 168°, and green from 168° to 171°. 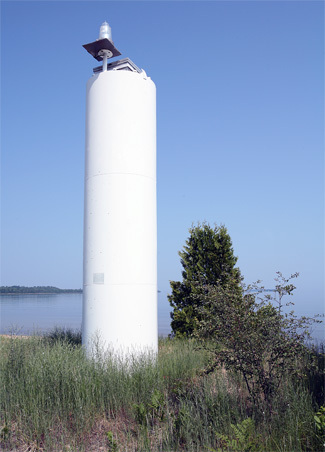 The present cylindrical D9 tower, which displays a high intensity beam on a bearing 166°, replaced the earlier front light in 1983. Head Keepers: Frederick M. Giertz (1868 – 1869), Samuel L. Barney (1869 – 1873), Napoleon Beedon (1873 – 1876), Casper Kuhn (1876 – 1894), Frank Brannock (1895 – 1902), Timothy E. Dee (1902 – 1913). Located alongside Highway 28 just east of Christmas. For a larger map of Grand Island Harbor Range Lighthouse, click the lighthouse in the above map. 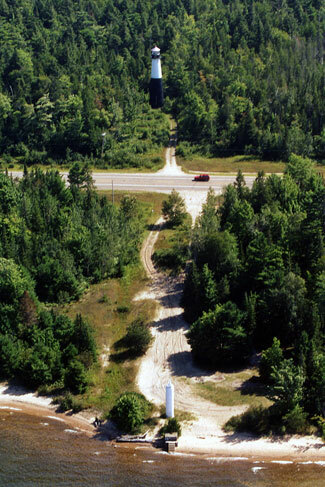 From Munising Range Lights, travel 3.6 miles west on Highway 28 and you will see Grand Island Harbor Range Lights alongside the road. From Christmas, travel 0.5 miles east on Highway 28 to find the lights. The towers are owned by the Forest Service and are managed by Hiawatha National Forest. Grounds open, towers closed. If you look at the top of the Grand Island Harbor Rear Range Tower you can seen an arched doorway just above the black/white line. It is believed that the upper portion of the tower was previously used at another station. Some sources say the upper portion came from Vidal Shoals Lighthouse, but it has been shown that that tower was used at Fourteen Foot Shoal Lighthouse. While you are in the area, a stop at the Bay Furnace Historic Site, located just west of the range lights is definitely worthwhile. The old stone blast furnace, where pig iron was made between 1870 and 1877, can be seen in the distance from the front range light.